Burlington, Vermont, hit 50 degrees Wednesday, according to the National Weather Service. NWS data showed it was the first time in 2015 the city reached that temperature. After a winter that brought strings of brutally cold days and biting winds, the warm-up was welcome to many across northern New England, including home builder Jonathan Shaw. Shaw, who was working on new construction Wednesday in South Hero, Vermont, said the rough winter did put him a bit behind on jobs, but the nice weather this week has helped him make up some ground. Shaw acknowledged Vermont is not out of the woods yet, though, when it comes to the potential for winter storms. "I imagine we'll have another big snow," Shaw told New England Cable News. "But at least we're getting the roof [of this house] on today, while we have the first three warm days of the year. And then we're good for whatever else comes." The Vermont Fish & Wildlife Department is reminding anglers that state law dictates ice fishing shanties must be removed from the state's frozen lake surfaces by the last Sunday in March or before the ice becomes weakened by melting. 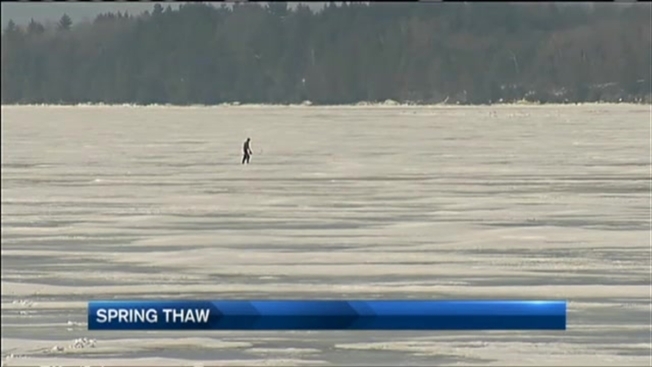 In Milton, ice fisherman Alan LaFrance and friends were enjoying what's left of their season. "It's about time," LaFrance said of Wednesday's pleasant weather. "We deserve this nice weather after what we've been through!" The spring temperatures this week also jump-started the flow of sap from Vermont's maples. At the historic Shelburne Farms, an education center all about sustainability, kids were learning how maple sap is collected and boiled way down to make sweet syrup. Vermont leads the nation in production of maple syrup, according to data from the USDA. And the success of the season depends on the weather: producers like to see temperatures in the forties during the day and dipping below freezing at night to get the most sap flow from their maples. "The problem is, if it gets warm really fast--like a few years ago it was 80 degrees in March--the trees really bud out and they're just done really quickly," explained Dana Bishop of Shelburne Farms. "So the longer we can prolong the spring process, the better the season is." One downside of the spring thaw has been the emergence of mud on Vermont's dirt back roads, marking the start of what the state calls "mud season."